We have learned from the many years past involving active shooter incidents, terrorist style attacks and other random acts of violence, that the single most widely experienced life threatening injury is due to severe and uncontrollable hemorrhaging. The single most critical item to treat this type of injury is a tourniquet. In any truely effective mass casualty kit this is a primary item and should be coupled with the ability to use on multiple victims from adults to pediatrics. The OSS School Classroom Kit is a mass casualty kit designed to be used by teachers, first responders or the average citizen with very little to absolutely no medical or first aid experience. These kits contain five (5) individual throw kits designed to be thrown, kicked, slid or skipped off any type of surface and remain in tact. 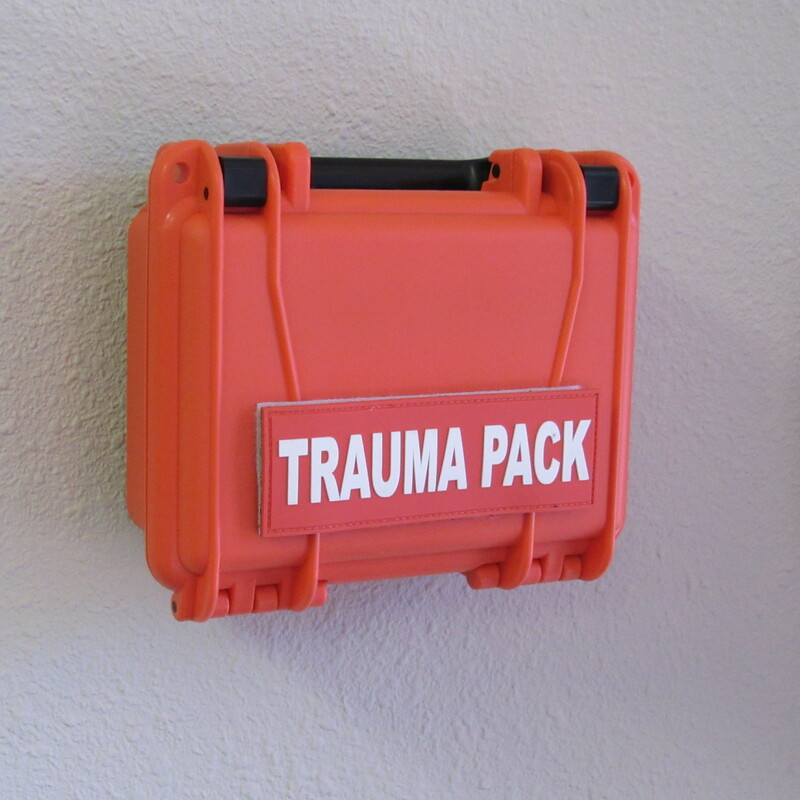 These throw kits are designed to directly combat any type of severe life threatening penetrating trauma injury. Each Throw Kit contains; a tourniquet, an OSS Combat Compression Bandage / compression wrap, Sterile Gauze Pack, a pair of nitrile gloves and a field use instruction card. The Hard Case is a virtually indestructable waterproof, crushproof, self contained environment with pressure relief valve and lockable closure tabs built to house the five (5) individual kits. It has an instructional placard mounted on the inside of the lid and the entire case is removable off the platform for instant deployment. It comes with all mounting hardware and instructions to mount next to any AED or Fire Alarm pull station or any designated area. These kits are currently approved and in use at several schools, universities, shopping centers, transportaion centers and public facilities globally. The throw kits contained in this pack are the smallest and thinnest "proven" Trauma Pack currently in production today, it is designed to be carried and deployed in any incident where the need to stop blood loss is present. The ability to save a life due to blood loss is critical but being prepared with the right pack is paramount. This easy to use pack contains the critical items needed to stop sever arterial hemorrhaging by applying a tourniquet and dressing the wound in preparation of advanced life care arrival. This pack is designed for the average citizen with very little to no medical training. This pack is currently being issued and carried in over 4100 Law Enforcement Agencies and Fire/Rescue Departments world-wide. It has been deployed hundreds of times and is responsible for hundreds of documented lives saved. ** This also comes with 24 hour Training Support which allows instant access to our in house Veteran Combat Medics and medical professionals ie; various endorsing ER Physicians and Trauma Surgeons throughout the nation. Set of Rescue Shears 7.5"